We had two very successful OpenBIM evenings in Melbourne last week, at SIAL (RMIT) and Arup. The first was recorded (although I'm going to re-record mine) and hopefully we can post soon. Matt Rumbelow of Revitall did a fantastic job of handling most of the organization, and it was great to see him show this video to promote and explain IFC (from nearly 20 years ago). Many thanks to Stephen Hamil for posting this for us all to access. It was great to meet Dr Thomas Liebich in person (after quite a few emails). One of the improvements in IFC4 that I wasn't aware of (or had implemented) prior to his presentation was a new tessellated shape representation optimized with objective of smaller file sizes. This is particularly useful given how many IFC files are generated with this primitive (useful enough for coordination or visualization) shape representation leading to bloated file sizes. I've now implemented it, and here is a comparison. 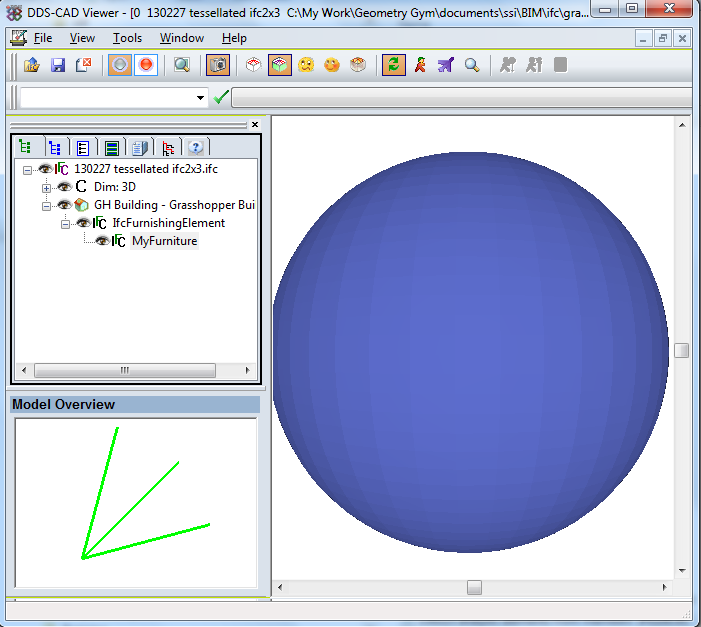 This mesh sphere (with 4900 faces) is generated in IFC2x3 (file) and IFC4 (file). IFC2x3 generated a file of 750kB and IFC4 214kB, an improvement of around 70%. When amplified over many objects (acknowledging real files contain other data influencing overall size improvement) this will still have a significant effect. If you want to test the generation of these models, the gh def is here. Note you right click on the ssiBake component to toggle IFC2x3 or IFC4.